Before 2013 closes out, I'm updating with a few of our Christmas happenings. 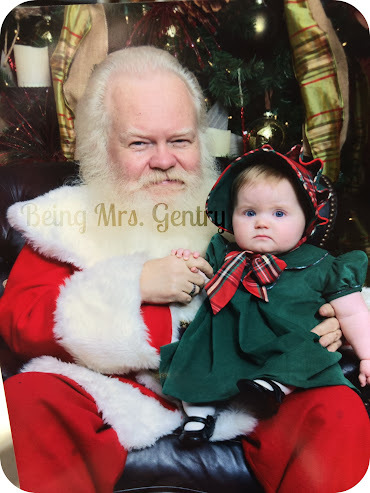 We spent a fun day over in Dallas at NorthPark where we saw the real Santa and did some of the last of our Christmas shopping. Mr. G had some things to wrap up at work before a long break, and our time to see Santa was limited, so it was just the kiddos and me. They were both so good the entire time. Annabelle got a little fussy as I was tying her bonnet on, but I explained to her that accessories are just part of being a girl. Today's bonnet is a pair of uncomfortable high heels during a 10 hour work day two decades in the future. NorthPark has a great system where you pick up a number, and that determines your place in line to see Santa. They start handing them out at 9 am. Apparently the day we were there, husbands/dads had started lining up at 7 am to get an early number. When we got there at 9:30 am, we got a number that was estimated to be for approximately 7 pm later that day. Thankfully, we were able to standby and scoot in right after lunch. 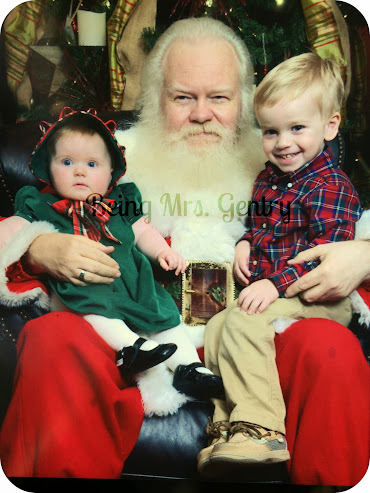 Surprisingly, it was probably the fastest we've seen Santa. Santa spent a few minutes with Jack, asking if and what kind of cookies we might make him. Jack told him that he wanted a "four-wheeler like Granddaddy's" for Christmas. No tears, only a little apprehension as we walked up. She was more like, "I'm not really sure what's happening here, but can we get this over with? I'd like to take my nap, please." My childhood next door neighbor commented on Facebook: "The place where anxiety and politeness intersect. That is a Texas girl."